Id like to add that if you're putting a double din in a 07-08 you do not need a dash kit. It will mount to the stock brackets. Hi....does a 7" dvd dash would fit in the stock brackets? So i would just have to remove the radio (where all the bottoms and the volumen controller are) and then put it in there or i need a dash kit for the 7" one? We have a local member that does HU installs, he should be able to answer that for you. Paging @kaygmaxima. This thread is for the 07-08, so I'm guessing one of those years. Oh, I guess I missed that part. I have had several double dins in my 07 and I havent used a dash kit yet. Im sure you wont need one. Wow...I didnt know that. Why dont you get a job at Best Buy? I have two reasons why I wouldn't want a job there. 1) now a days it's so easy to get a license to work there that the job demand is way too high installing audio for them, me being a student they would much rather hire someone who can work full time and not part time just like me so it's usually two workers there from open to close every day of the week so me landing a job there would be impossible on my schedule. 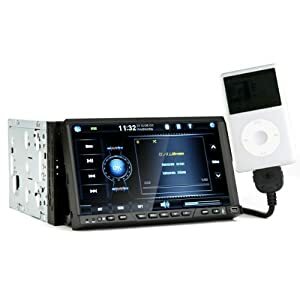 Whew, I almost bought one of these for my new double din unit. So if you dont need a dash kit then it means all the 7" dvd dash have the same measure...7 " lenght and 4 " height right? If anyone is interested I'm selling a double din kit and antenna in my for sale thread!!! is there a kit for a 07+ 6.5 gen with factory navi? Never seen one for the models with navi. Got an aux or satellite radio input that you are not using? WOW, OG member here, where have you been bro? this place is pretty quite, everyone is on FB now man. I unplugged myself. Felt like i was spending too much time online. Took up fishing and wood work in its place. I still got online to pay bills but not much else. Long story.